It takes a lot of courage to wear red. It's also safe at times to stay neutral. So what happens when you're the man who wants to stay courageously composed? 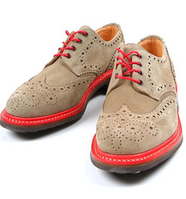 He opts for items like Mark McNairy's Country Brogue, a collaboration with the influential Los Angeles boutique Union. A bit of dandy pop to update and liven up a stately classic shoe is just the courage one needs while remaining sartorially neutral. Available now at Union LA.